Well, you may have heard a lot of stories about affiliate marketing successes! 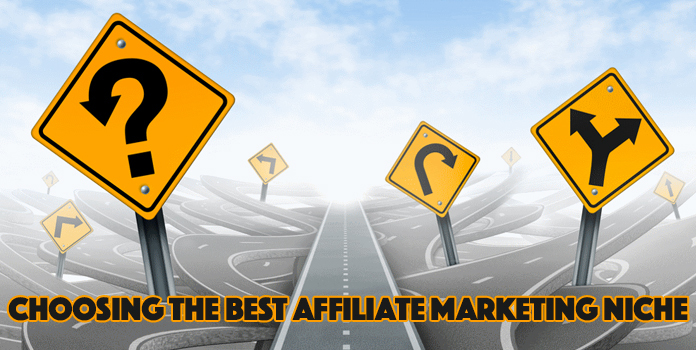 And these stories might have urged you to take a decision to be an affiliate marketer. If I am not wrong, your next step would be to choose the best affiliate marketing niche, right? If you are hovering around this famous problem of selecting the most profitable niche, then my friend, you are not alone! There are hundreds and thousands of beginners who are constantly in search of the right answer. The reason is quite simple. A lot of competition is there and you need to find the niche with fairly less but significant competition and good revenue. This is why there is a lot of importance given to this issue of choosing the best affiliate marketing niche. Well, do not worry as we have devised some excellent tips and strategies to help you out! Understand your interests and then find a way to earn money through it! No one can deny that what you love in your life provides the best interest to you! And I believe that this applies to affiliate marketing as well! Work out what you love most in your life and what is your hobby. Once you have worked out, look out for the websites which serve in the space of your interest. Check Clickbank.com and Amazon.com. Here you can search for your interest like ‘Weight loss” or “Pet training”. Find out if there are a good number of products in that niche. If yes, you are good to start! Use “Google Keyword Planner tool” or “WordTracker.com”. You can find out what people are searching on the internet with the help of these tools. Just enter the keyword related to interest (For example- gardening) ad you will get thousands of related searches. Now look out for Paid advertising results. See if there are a lot of sponsored results whenever you run a Google search with your keyword. If yes, this is a great sign of profitable niche. If you want to grow as an affiliate marketer, you need to take the assistance of some great tools. ClickBank is such great tool which can help you a lot! It is time to visit ClickBank and search for some good products for affiliate marketing. One great feature in ClickBank is ‘gravity’ which is a measure to represent how well a product sells. So, a gravity of 30+ is a good sign that your product will sell good and has a good market around. These products own a proven record of doing well in the field of affiliate marketing. If the gravity is below 30, the chances of wasting your time in those niches are higher. There is a simple reason behind selecting a niche with multiple products. If there is a single product only available in a niche, even if the product sells like hotcakes, you will face a lot of competition and tough time in selling that unique product. The other advantage of a niche with multiple products is that you can increase your chances of selling. By seeing other related products in your page, visitors will feel that they have completed the evaluation and they can now start purchasing what they want! Simply, your efforts will not be justifiable if you get low commissions. If you really want to make your marketing efforts worthwhile, you need to sell out the products with a high commission. Keep in mind that you also need to deduct your advertising expenses i.e. Adwords and other paid efforts. So the commission has to be significant! Well, in most cases it is expected to be 65% or higher! So never miss your first and most important step as an affiliate marketer! Choosing the best affiliate marketing niche is what you need first and if you do it right, you can drastically improve the chances of earning a decent income every month! Hope you really enjoyed the tips and strategies mentioned here! Previous articleHow PPC Can Grow Your Online Business?